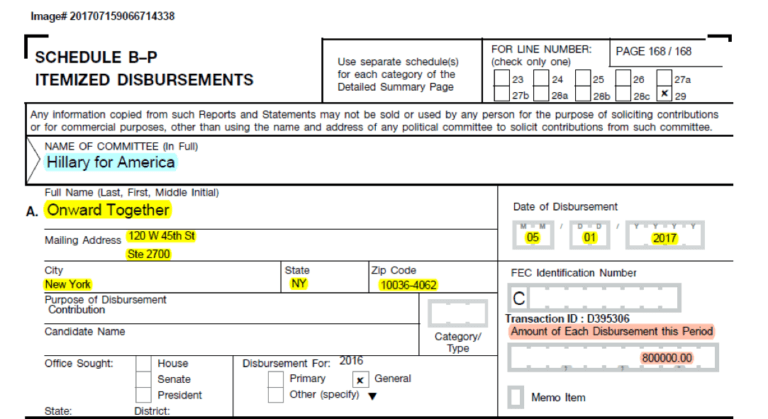 Most people are aware that “Onward Together” is a political organization to raise funds for the Democratic party, but what they don’t realize, is the fact that this tax-exempt 501(c)(4) is operating ILLEGALLY, on multiple levels. IRS laws, FEC documents, and Onward Together’s tax return create one heck of a recipe, burning for an investigation. Not only does Onward Together require scrutiny, but its partner organizations also need a closer look as well. 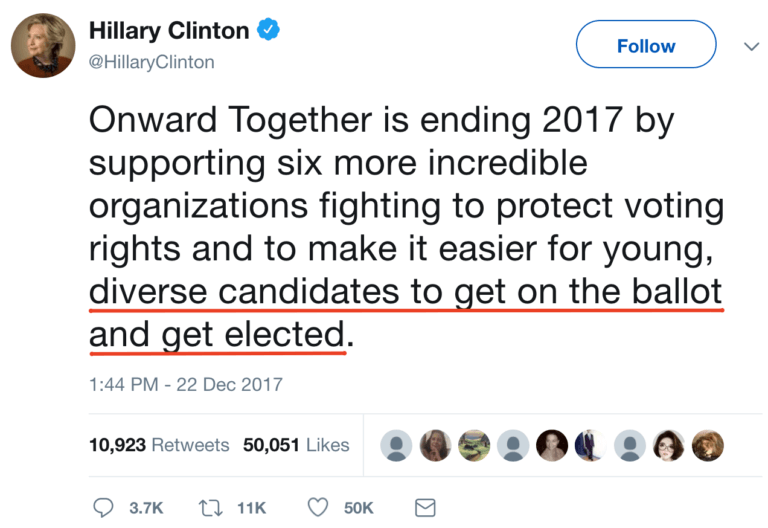 Perhaps “Back Together” would have been more apropos, since Hillary Clinton got the band back together to form this tax-exempt political scandal. Even Huma Abedin is on the payroll. What’s most interesting is that the DNC paid nearly $2 million to Onward Together for donor list rental/acquisition produced by Hillary for America, while the DCCC paid more than $700,000 for the same list. Sure, politicians often sell “donor lists”, but Onward Together is not allowed to declare the payment as tax-exempt “royalty income,” nor does this political activity align with the lawful purpose of 501(c)(4) organizations. But it gets worse. In order to avoid unrelated business income taxes, some exempt organizations have attempted to classify, as royalties, payments that are in fact fees for services. The IRS, however, ignores contractual nomenclature and looks to the true nature of such transactions. For example, royalties were ruled not to include payments for personal appearances (Rev. Rul. 81-178, 1981-2 C.B. 135) or receipts from the rental of donor lists(Disabled American Veterans v. United States, 650 F.2d 1178 (Ct. Cl. 1981). Additionally, if the exempt organization maintains control over or liability for the commercial enterprise, the royalty exclusion will likely be denied. Thus, payments derived from a license of property under which an exempt organization was liable for some development and operational costs were treated as unrelated income. (Rev. Rul. 69-179, 1969-1 C.B. 158). It’s important to note that specific laws apply to tax-exempt organizations, such as the percentage of “unrelated business income,” which could result in a loss of tax-exempt status, if that portion is substantial. Based on their tax return, it would be difficult for them to justify their tax-exempt status. According to the expenses indicated on their tax return, they shelled out $1,034,514 in fundraising, $480,000 in grants to political 527 organizations, and $500,000 in grants to questionable and political 501(c)(4) organizations, and over $400,000 in payroll and professional fees, accounting for over 80% of expenditures. That goes way beyond the limited political scope allowed. What’s worse, is they only paid taxes on the $480,000, while listing over $3 million as “royalty income,” which presumably accounts for the funds received from the DNC and DCCC, being as they do not appear to be included anywhere else in the return. Contributions to a 501(c)(4) are not tax-deductible. Nevertheless, these entities are not supposed to promote or advocate specific candidates in elections. So, in theory, politics should play only a tangential role, if any, in the operation of a 501-C4. In practice, however, 501(c)(4) organizations can operate in tandem with other like-minded entities, whether 501(c)(4 or 501(c)(3). If these entities are not scrupulously managed, “joint costs” can be allocated in ways where they become disguised political contributions, or even payoffs to ghost workers or vendors. For example, travel and other third-party costs can be over-billed to the nonprofits, subsidizing political campaigns. Or, workers on political campaigns can be underpaid by the campaign, with additional payments routed through the nonprofits. Another issue is that many of the ostensible regulators of nonprofit abuses, for example Lois Lerner, are married or linked to others who are paid by or who support nonprofit entities. Fair application of existing laws and precedents to flagrant, as yet unprosecuted charity and nonprofit frauds that remain ongoing, might yield billions of dollars in revenue, just when our federal, state and local governments are desperate to balance their budgets. Despite the fact that Hillary Clinton’s name does not appear as a director, trustee, on the board, or under payroll, the entire organization is promoted by her as it being hers. 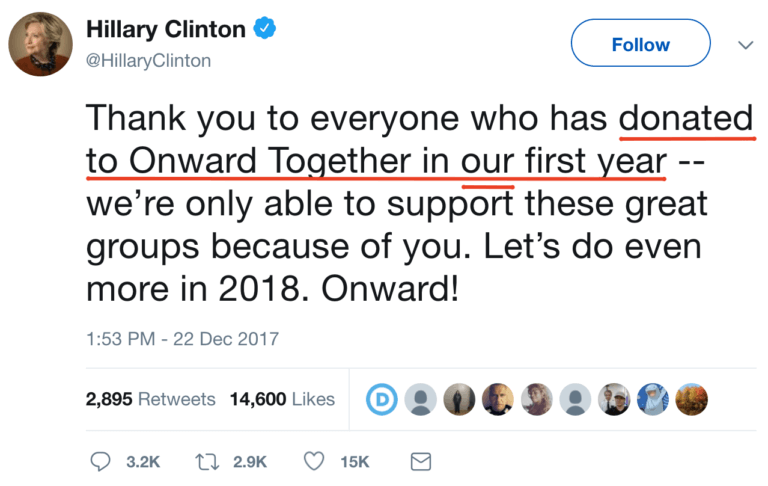 Additionally, she had contributed $800,000 from Hillary for America (her presidential campaign) to Onward Together just two weeks before its public launch, accounting for 25% of the overall donations. She also solicits for donations, and is seen in countless photographs with those she refers to as “OUR Partners.” But then, why would she have her name listed, when Mark Elias of Perkins Coie, LLP, 2016 presidential campaign attorney, is listed as the incorporator? Anyone can create a corporation, and pay an attorney to register it for them so that their name isn’t reflected on public documents. While they declare in their Bylaws and on their 990 that they are operating with this intention: “By encouraging people to organize, get involved, and run for office, Onward Together will advance progressive values and work to build a brighter future for generations to come,” they continue to make requests for donations, while stating, “Chip in today to help Onward Together support the people and organizations championing the vision that earned nearly 66 million votes in the 2016 election.” In short, this is 100% political, as demonstrated with their partnerships as well. Interestingly, their far-reaching donors expand across 250 foreign countries, including the Russian Federation. 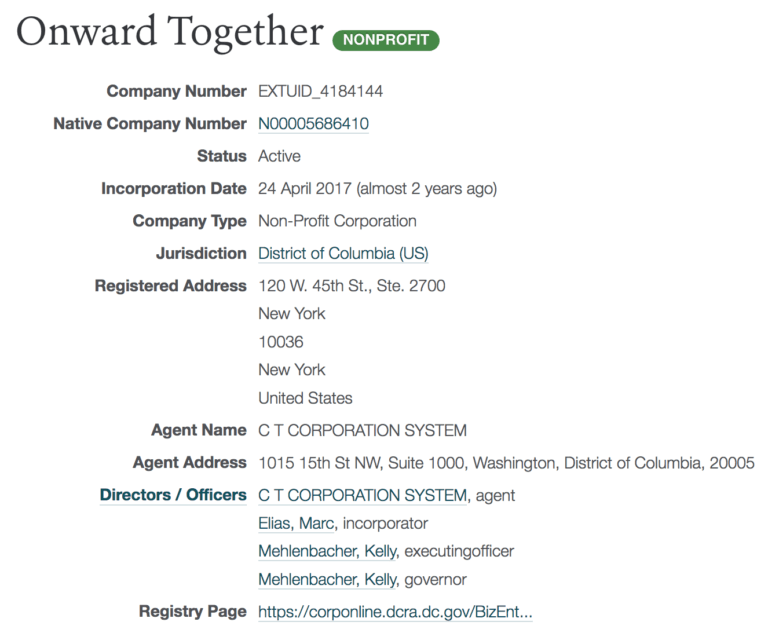 Onward Together was incorporated on April 24, 2017 by attorney Marc E. Elias, in the District of Columbia. Elias is a partner in the law firm Perkins Coie, LLP, so it’s no surprise that he is the “incorporator” on this organization. 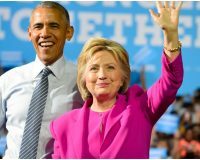 Not only was Elias the attorney for Hillary Clinton’s 2016 presidential campaign, but his law firm has long represented left-wing political organizations, such as the DNC, Democratic Congressional Campaign Committee, Democratic Governors Association, and the Democratic Senatorial Campaign Committee. Perkins Coie, the law firm that represented both the DNC and the Clinton campaign during the 2016 election, belatedly admitted it paid Fusion GPS for Steele’s work on behalf of the candidate and party and disguised the payments as legal bills when, in fact, it was opposition research. When Bruce Ohr was asked if he knew of any connection between the Steele dossier and the DNC, Ohr responded that he believed the project was really connected to the Clinton campaign. Even the New York Times and Washington Post reported on Perkins Coie’s involvement, stating the Clinton campaign and the DNC, through the law firm, continued to fund Fusion GPS’s research through the end of October 2016, days before Election Day. So basically, Marc Elias and his law firm Perkins Coie have been handling Hillary and the DNC’s dirty work for quite some time. Baker was the former chief administrative officer of Hillary for America, as well as serving as a senior advisor for the DNC, Clinton campaign, and many others. Cheng was not only the finance director for Hillary’s 2016 presidential campaign, but he was also the chief development officer for the Clinton Foundation from 2011-2015. Mehlenbacher was the treasury manager of Hillary for America, and was the deputy White House liaison to the U.S. Department of State from 2011-2014. According to her LinkedIn account, she also handled the accounting for HillPAC from 2008-2009, as well as Hillary Clinton for President and Friends of Hillary from 2007-2010. Between all of this Hillary Clinton work, she managed to squeeze in a year with USAID as well. Moore served as the assistant to the president and director of White House political affairs, under former President Bill Clinton. She was also Hillary’s senior political consultant for her 2008 presidential campaign. In addition, she served as the CEO of the DNC. Add to this, these additional Democratic sidekicks, such as: former Democratic Vermont Governor and DNC Chair Howard Dean, Judith McHale, as well as Emmy Ruiz, Adam Parkhomenko, Amy Rao, and Nick Merrill, all working with Onward Together to advance its partisan political agenda. 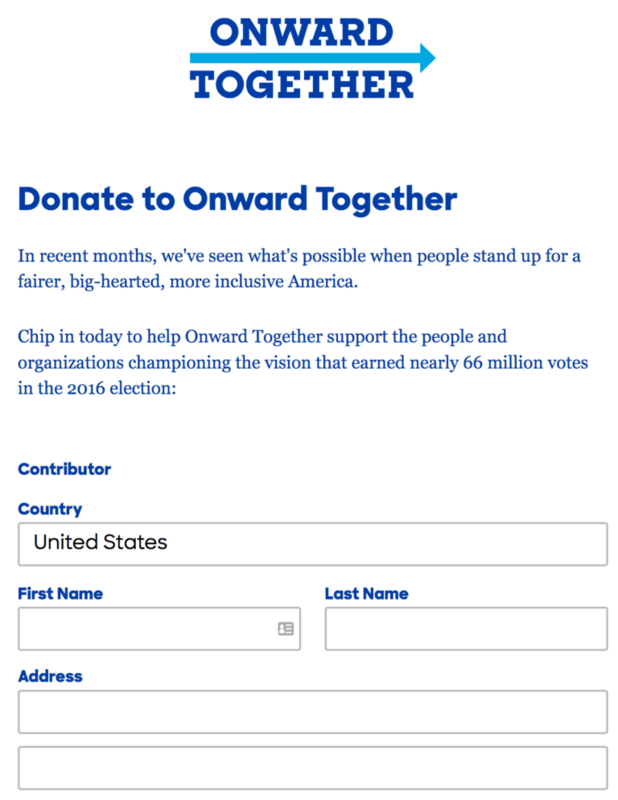 Aside from the staff, the non-profit organizations that Onward Together partners with are both political and Democratic. This more than substantiates the fact that this is a very strong political agenda that goes far beyond what they claim their purpose to be on their tax documents and is certainly far too excessive for their tax-exempt status. Despite Hillary’s name being excluded on public documents, because Marc Elias of Perkins Coie set it up that way, it’s quite clear who the ringleaders are. 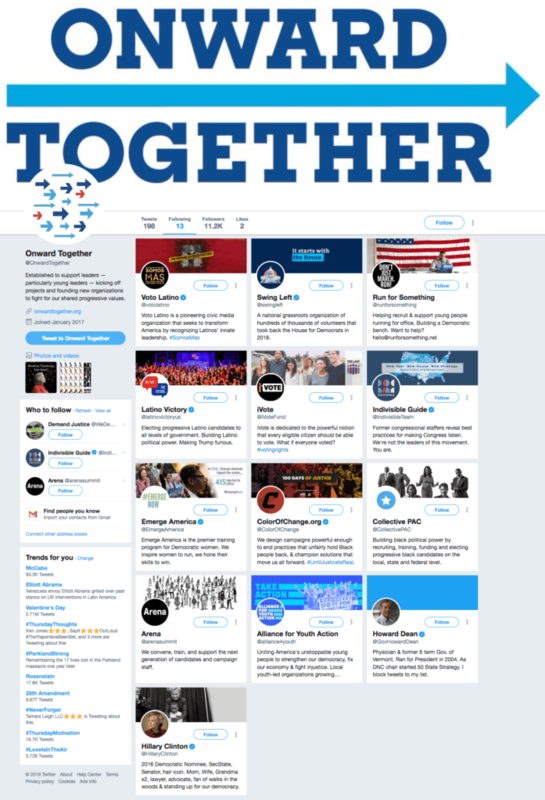 Onward Together’s twitter page, consisting of 11.2 million followers, only follows eleven partner organizations, Howard Dean, and Hillary Clinton. That pretty much sums it up. Technically, their twitter page launched in January 2017, the moment President Trump stepped into office, and Onward Together wasn’t formally incorporated until April 2017. A 501(c)(4) is a tax-exempt organization in which the IRS allows for donors to remain anonymous, and there is no limit to the amount they can donate. It was established with the intention of social welfare programs, not for political purposes. Minimal political activity, such as lobbying or advocating to raise funds for a local nursing home would be permitted. However, it is in place for the social welfare of people and communities, not for political agendas. Nor is an organization permitted to fund or back candidates. Politics absolutely cannot be the driving cause of a 501(c)(4). Certain grants/payments are taxable, even under a tax-exempt 501(c)(4), and must be filed correctly. In addition, all declared “royalty income” is required to submit attached documentation that itemizes those funds received, which are tax-exempt. According to their website, some of their many partners are: Alliance for Youth Action, The Arena, The Collective PAC, Color of Change, Demand Justice, Emerge America, Indivisible, iVote, Latino Victory, National Domestic Workers Alliance, Run for Something, Swing Left, and Voto Latino. Just to put this in perspective, these “partners” together create a country-wide reach, with intentions of flipping votes blue, fundraising for Democratic candidates, and training and recruiting people to run for office. As an example, Swing Left was launched just one day before Trump’s inauguration to “take back the house.” They not only fundraise for Democrat candidates, they also hold voter contact events in 50 swing districts. 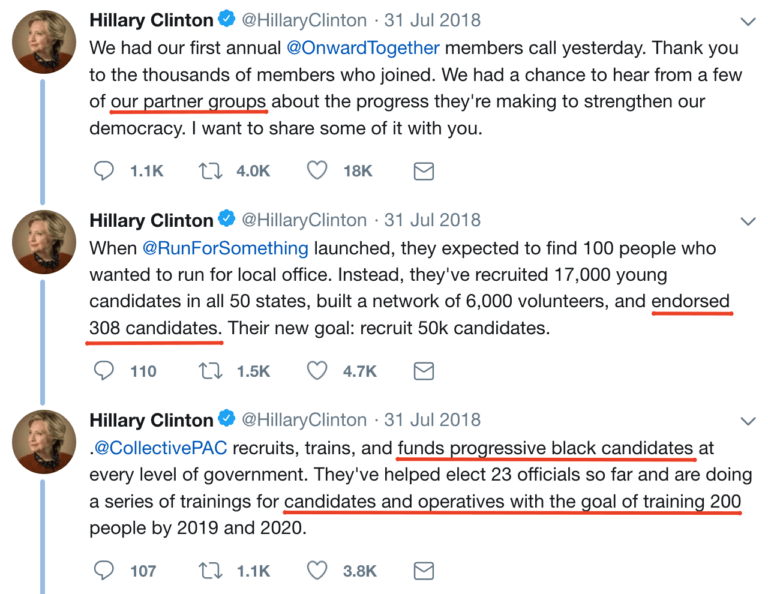 Run for Something is a PAC operating out of multiple states, that Hillary has recently been tweeting about. They’ve recruited more than 17,000 young activists, students, and community leaders, as well as endorsed and supported 10 young candidates in the Virginia House of Delegates elections. 40% of those candidates won their races in Virginia, Pennsylvania, Georgia, and more. As of 2018, they have endorsed more than 200 candidates. They actually state on Onward Together's website, “After Justice Anthony Kennedy announced his retirement from the Supreme Court, Demand Justice leapt into action, launching a movement to demand that Democrats in the Senate oppose anyone on Donald Trump’s SCOTUS shortlist,” as well as, “…motivating progressive voters on issues related to the federal judiciary while influencing the Senate on judicial nominees. Indivisible has worked with Planned Parenthood and ADAPT to direct thousands of people to town hall meetings across the country, and “hundreds of thousands of calls to members of Congress to help defeat the Republicans’ repeal of the Affordable Care Act.” In 2018, they expanded their electoral work through a 50-state political program, with the goal of taking back the House and Senate, elect progressive governors, and flip state legislatures. iVote has big intentions, which focuses on investing in campaigns to bring automatic voter registration to multiple states, AND by electing voting rights champions to be the chief election administrator in the office of the secretary of state, in battleground states. They invested $5 million in efforts to elect Democratic, pro-voting rights secretaries of states in Arizona, Colorado, Iowa, Michigan, Nevada, New Mexico, and Ohio, while working to advance legislation. They are not messing around. 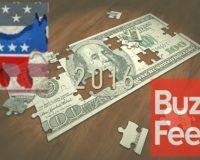 Each of the “partners” Onward Together works with and funds, all have similar agendas. 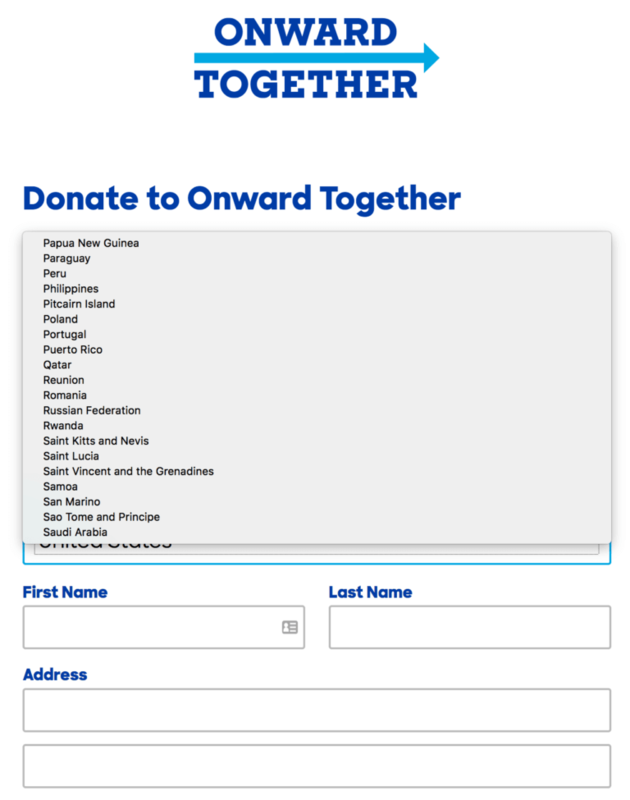 It is quite clear that Onward Together is operating fully for political purposes of Hillary and the Democrats. Their tax-exempt status should be revoked immediately. 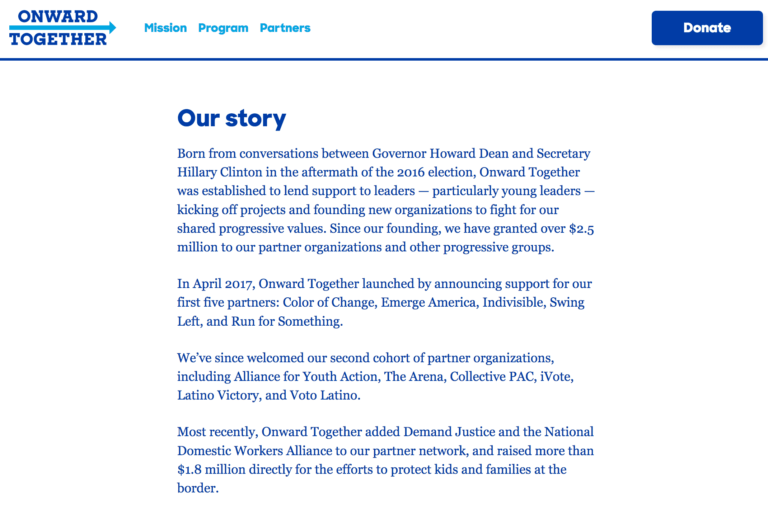 All it takes is a little bit of digging to see that Onward Together is operating with a political agenda, while funding partners who are also 501(c)(4)s, to fundraise for, promote, and advocate for specific candidates in elections. This breaks all IRS laws pertaining to 501(c)(4)s and their tax-exempt status. It is extremely probable that the $3 million declared as “royalty income” should have been filed under taxable income, and that those specific funds came directly from the DNC and DCCC. A big no-no. Clinton family has long mingled political activities with charitable activities, operating virtually all of these pursuits in evident defiance of the strict letter and intent of applicable laws and regulations. 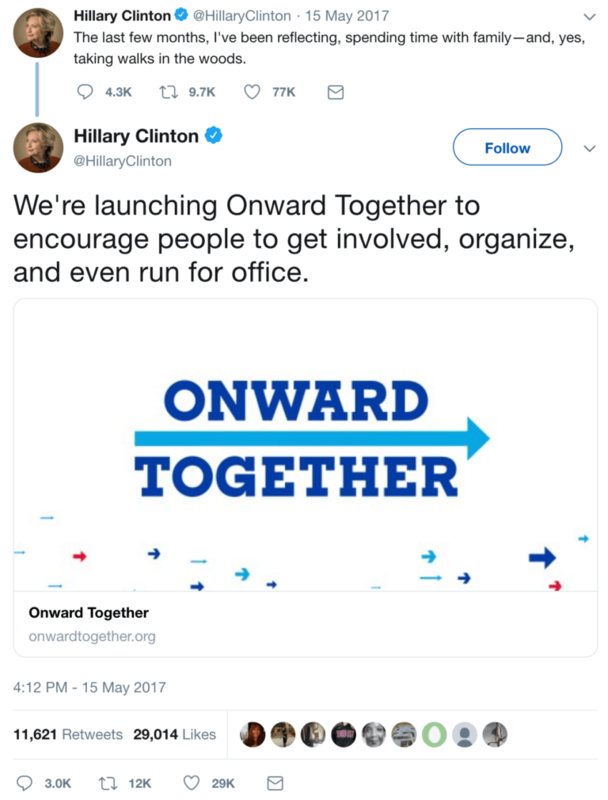 It would not surprise me in the slightest to learn that Onward Together is yet another poorly controlled false front nonprofit whose true intent is to advance the political and personal interests of the Clintons, in the guise of being a “lawfully” organized and operated nonprofit. This begs the question, is this another one of Clinton’s organizations that should be brought to the attention of the IRS? 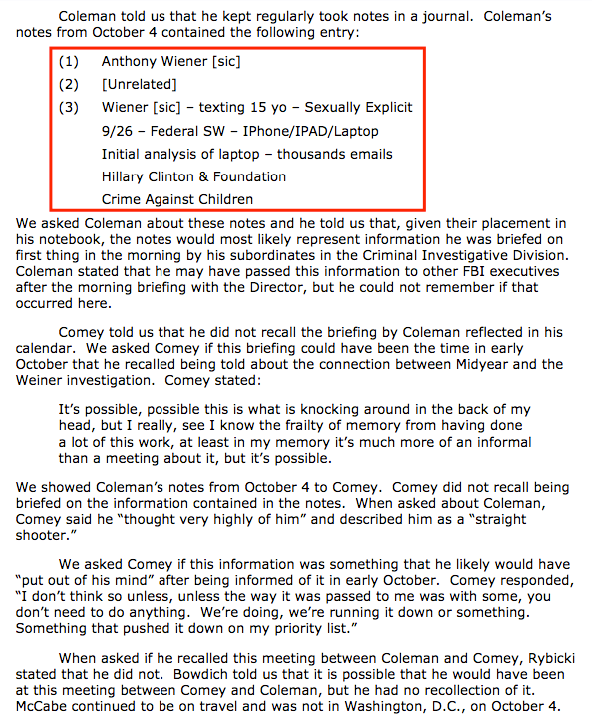 There was a recent case where financial investigators Larry Doyle and John Moynihan came forward as outside whistleblowers, and filed documents against the Clinton Foundation’s wrongdoing. This was covered in Arkansas Swamp Part 2. The IRS (and state taxing authorities) do not have resources required to police informational returns and other public filings of organizations that are themselves exempt from income taxes, and can offer donors potential to realize income tax deductions for portions of their contributions. Over time, a system has evolved where the IRS reviews complaints submitted by whistleblowers, and then may elect to work with relevant government authorities to prosecute charity frauds, and potentially related offenses (including Income tax evasion, money-laundering, public corruption, material false statements under oath). As Doyle and Moynihan explained, they have submitted evidence of criminal wrongdoing to multiple government entities, in an effort to prod these public servants to protect the overburdened treasuries by assessing fines, penalties, back taxes, and interest against certain charities that do not seem to have been lawfully organized or operated. I imagine that the IRS welcomes tips from all whistleblowers who may wish to come forward, but that it makes little sense, at this stage, to pile onto the Clinton Foundation given all the work that seems already in progress. That said, there are too many loosely controlled supposed “charities”, that do not have strong governance controls and may also choose to operate internationally in places where temptations are great for fraud, for money-laundering, and for corruption. He couldn’t be more correct – the IRS does not have the resources required for oversight. 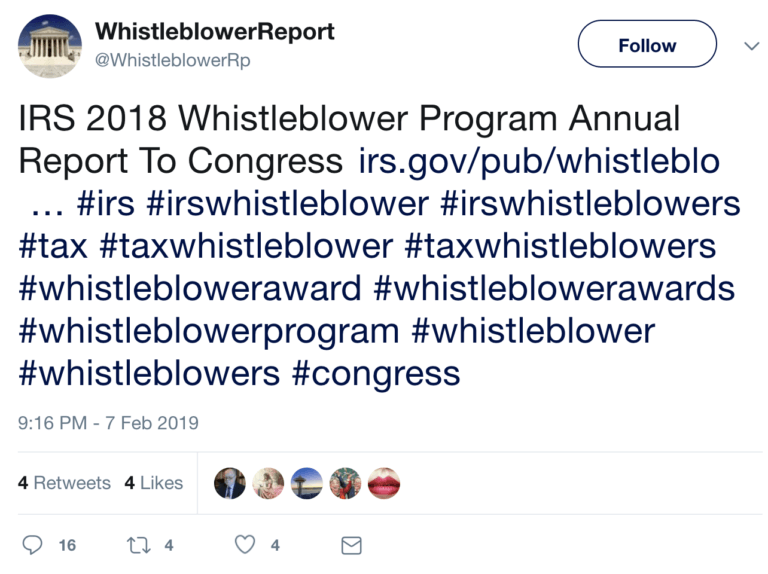 Coincidentally, they just tweeted out an announcement about the release of their Whistleblower Program’s Annual Report, on February 7th. They seemed pretty jacked up about this, with a dozen hashtags in place. Ironically, this report indicates that their entire staff of 36, only accounts for 12 case development and oversight employees. Let’s repeat that just in case any details were missed. The entire staff for the IRS whistleblower department, that handles ALL complaints for the entire country, is 12 individuals. And, they actually reduced that number by 1 person from 2017. Let that sink in. 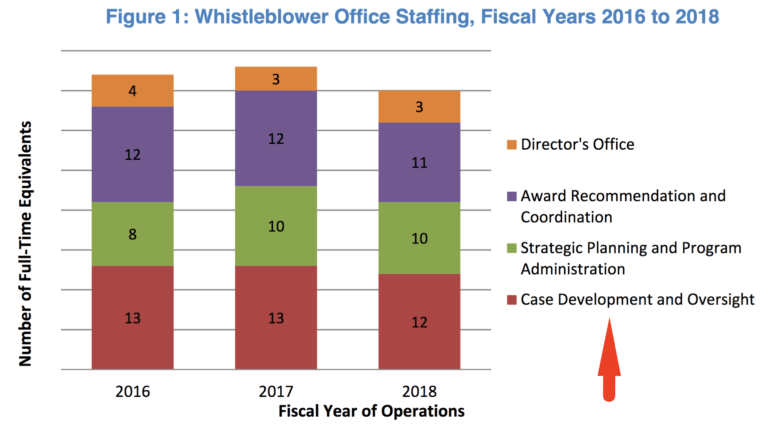 With hundreds of citizen journalists, and thousands of researchers working their tails off to expose seemingly endless levels of corruption throughout this country, one would think all existing whistleblower departments should have quadrupled in size by now. Now that would be taxpayer money well spent. Meanwhile, those taking advantage of the system, running illegal non-profits, and escaping tax payments, while running large-scale political agendas that could have a huge negative impact on this country, are skipping around with a smile on their face. For now, Hillary Clinton lives to see another day, as her criminal actions continue to be exposed. Hopefully one day soon, her rap sheet will be in history books, while she’s watching One Flew Over The Cuckoo’s Nest , wishing it was her heading to a mental institution, from behind bars. Previous Aurora, Illinois Shooting: Catalyst For Dem/Trump Unconstitutional Laws? Corey Lynn is an investigative journalist who digs for truth in a world where nothing is as it seems, and then connecting the dots and presenting her findings to you. You can follow her work at CoreysDigs.com.